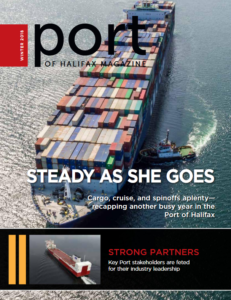 Published quarterly, Port of Halifax Magazine is distributed free of charge to maritime, industrial and transportation interests around the world. The magazine is produced by Metro Guide Publishing in collaboration with the Halifax Shipping Association and the Halifax Port Authority. To subscribe, send your contact information to publishers@metroguide.ca. To inquire about advertising or editorial content, please contact Metro Guide Publishing at (902) 420-9943.